Have you met my friend War of Will? Bob Baffert’s top two horses suffered their first defeats at the Rebel Stakes this past weekend. The Kentucky Derby contenders list is considered to be wide open. One of the horses that has emerged as a front runner to win the Derby will run in this week’s Louisiana Derby and is favored to win the race. 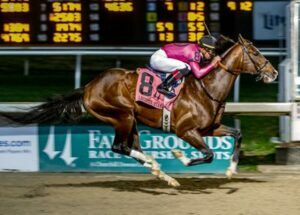 During his practice run for the Louisiana Derby, rival trainer Bret Calhoun was impressed with what he saw from the Mark Casse trained three-year-old. This will impact Derby betting odds. “He stepped up and ran a huge race that day, then came back and repeated it,” Calhoun said of victories in January’s Lecomte Stakes (G3) and February’s Risen Star Stakes (G2). Calhoun also considers War of Will to be the favorite to win the Louisiana Derby. Even though he is favored to win the race, War of Will is expected to be challenged by Country House, Roiland, Hog Creek Hustle, and Limonite. Calhoun is hoping his horse, By My Standards, performs well at the Louisiana Derby after a first place finish in his last race. What does this news mean for War of Will? “I lost a little confidence when he was third the first time down here,” Calhoun said. “Just didn’t understand how he got beat that day. I think it was more of a mental lapse. He just didn’t quite know how to finish the race off. If War of Will wins the race, he likely won’t run again until the Kentucky Derby in May.